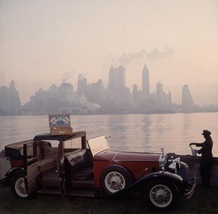 A chauffeur unpacks a picnic hamper from a Rolls Royce, against the New York skyline. Copyright Getty Images. American photographer Slim Aarons (1916-2006), born George Allen Aarons, is best known for his work photographing the American aristocracy and celebrities of Hollywood. At 18 years old, Aarons enlisted in the U.S. Army and soon became a combat photographer for the Second World War. Aarons returned to America after the war finished, and, having witnessed the grim reality of conflict, decided to concentrate on photographing the colourful, sun-dazed glamour of celebrities, jetsetters, and socialites. Aarons’ work is admired for his brilliant use of natural light and awareness for great compositions.